Yokosuka is America's most important naval facility in the Western Pacific, and the largest, most strategically important overseas US Naval installation in the world. The centerpiece of the Pacific Fleet forward presence mission is the Forward-Deployed Naval Forces (FDNF) in Japan. The 17 ships in Japan make up the KITTY HAWK aircraft carrier battle group in Yokosuka and the BELLEAU WOOD amphibious ready group in Sasebo. Having ships in this strategic location gives a great deal of capability for the dollar because the Japanese government funds over 70% of total US military support expenses as host nation support, which totaled approximately $5 Billion in 1998. FDNF is also a force multiplier that gives us significant leverage in these asset-limited times. It would take three to five times as many ships from mainland US bases to provide the same presence and crisis response capability as from the FDNF. Although FDNF ships normally combine with rotational deployers from Hawaii and the west coast to engage Western and Southern Pacific countries, their strategic positioning makes them fully capable of providing initial and substantial response to other theaters. Yokosuka has 18 ship berths, five tugboats, and numerous anchorages, as well as the only degaussing range in the western pacific, which is used jointly with the JMSDF. Piedmont Pier is where Yokosuka's forward deployed aircraft carrier is usually berthed. While the pier was being renovated, the carrier was berthed at Sherman Pier. Fleet Activities, Yokosuka boasts the largest and best of everything the Navy has to offer, with 23,000 military and civilian personnel. COMFLEACT Yokosuka comprises 568 acres and is located at the entrance of Tokyo Bay, 43 miles south of Tokyo and approximately 18 miles south of Yokohama on the Miura peninsula in the Kanto Plain region of the Pacific Coast in Central Honshu, Japan. The 55 tenant commands which make up this impressive installation support WESTPAC operating forces, including principle afloat elements of the United States SEVENTH Fleet and COMDESRON 15, including the only permanently forward deployed aircraft carrier, USS KITTY HAWK (CV 63). The new Fleet Activities Center was constructed as part of the Japanese facilities improvement program, under which the Japanese government provides support for the maintenance of U.S. forces to assist in the defense of Japan. Just past the new Fleet Activities Center is the Fleet Gym, a converted warehouse which has been in continuous use since the 1940's which will be replaced once the Fleet Activities Center is completed this year. The new Fleet Activities Center boasts a wide variety of services, including a mini-mart, barber shop, full service gymnasium, Fleet Lounge, roller skating rink, overseas telephone service center, internet Surf shop Cyber-cafe, and more. With the onset of hostilities in Korea on June 25, 1950, Yokosuka Navy Base suddenly became very important and extremely busy. The US , although still an occupying power in Japan, turned its full efforts to the support of South Korea. The Navy Dispensary was enlarged and expanded and was commissioned a US Naval Hospital in 1950. 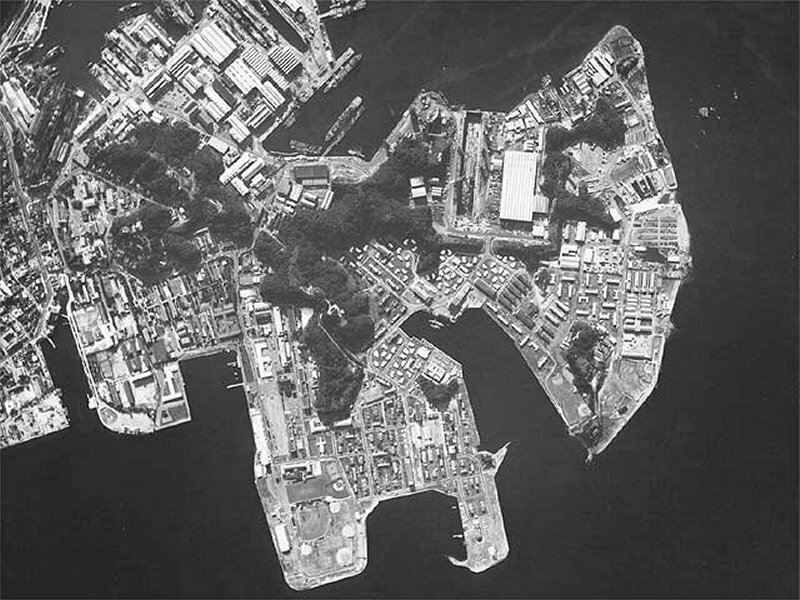 The Naval Communications Facility, Yokosuka, was commissioned in January, 1951. In April 1951, the Ship Repair Department became a component command. It was redesignated the Ship Repair Facility. As the major naval ship repair facility in the Far East, the Yokosuka Facility assumed a vital role in maintenance and repair of the US Seventh Fleet during the Korean and Vietnam conflicts. In March, 1952, the geographical boundaries of the command of Commander Naval Forces Far East changed to exclude the Philippines, Marianas, Bonin and Volcano Islands. In December, 1952, the Headquarters were shifted from Tokyo to Yokosuka. The expanded Supply Department of Fleet Activities became the Naval Supply Depot, Yokosuka in August, 1952 and in 1960, the Naval Communications Facility was redesignated US Naval Communications Station, Japan. Under BRAC 95 Guidance, Naval Pacific Meteorology and Oceanography Facility disestablished in April 1999. Functions associated with the Joint Typhoon Warning Center shifted to Pearl Harbor, Hawaii in January 1999. Functions associated with the Naval Pacific Meteorology and Oceanography Center West gradually shifted to Yokosuka, Japan between October 1998 and April 1999. The U.S. Naval Ship Repair Facility is the largest naval ship repair facility in the western pacific. SRF can handle any ship in the U.S. Navy up to and including conventional aircraft carriers, for almost every type of ship repair. The facility's tradition and "roots" were firmly implanted in 1865 under the patronage of the Tokugawa Shogunate when the "Yokosuka Iron Works" was established. Since that time the shop and waterfront facilities have been extensively developed and expanded. During World War II this shipyard was one of the largest shipbuilding and repair sites of the Imperial Japanese Navy, employing over 40,000 people and building over 100 combatant ships. The facility was reopened by the U.S. Forces on 28 April 1947 as the "Ship Repair Department", Fleet Activities, Yokosuka, with an Officer-in-Charge and a staff of 75 U.S. Navy personnel and 576 former Japanese Imperial Navy employees. At that time the facility occupied about 72 acres, approximately one-quarter of the former Imperial Japanese Navy Shipyard. On 15 August 1951 the facility was officially designated the "U.S. Naval Ship Repair Facility" by the U.S. Chief of Naval Operations, and a Commanding Officer was assigned. On 29 March 1976, the Commanding Officer established a Sasebo office with a staff of seven Japanese. On 1 March 1984, the U.S. Naval Ship Repair Facility Detachment, Sasebo was officially established by the Chief of Naval Operations led by an Officer-in- Charge. Today the facility employs about 1,800 full-time Japanese Nationals (90 in the Sasebo Detachment), who are assigned throughout the organization, including top management, and 145 U.S. military and civilian members. With the closing of Subic Naval Base, The Fleet and Industrial Supply Center (FISC) Yokosuka has taken on additional responsibilities and is now the U. S. Navy's largest supply facility in the Western Pacific. FISC Yokosuka is one of the Navy's eight supply centers and is the largest in terms of annual sales. Its mission is to provide supply and support services to fleet units and shore activities according to policies and procedures prescribed by the Commander, Naval Supply Systems Command. FISC Yokosuka, in conjunction with Defense Distribution Depot Yokosuka (DDYJ), carries nearly 91,000 demand-based line items and 28,000 DLR's in support of 16 ships home ported in Yokosuka and Sasebo, plus shore activities throughout Japan and Korea, and numerous transient vessels. FISC Detachments in Sasebo and Tsurumi comprise the largest (11 million barrels storage) and most active bulk fuel complex in the DOD, and represent over 50 percent of all fuel assets in the Pacific. The support is provided through seven ocean terminals that span 1,200 miles from Hachinohe on Northern Honshu to Sasebo on the southern island of Kyushu. Fuel quality surveillance is provided by the laboratories located at each of the detachments. Some of the facilities now occupied by FISC are of pre-World War II vintage, having been developed by Japanese Imperial Navy for a myriad of purposes. The largest building on the navy base, building J-39, which currently houses the FISC freight terminal operations, was previously a submarine factory and ship construction facility for the Imperial Navy. FISC Yokosuka facilities include l6 major warehouses, two cold storage facilities, and 125 major fuel tanks. 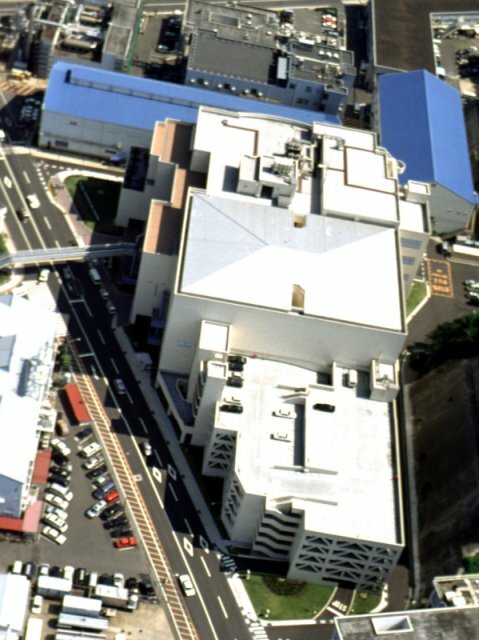 The FISC facilities are located in three geographic areas in Japan: Sasebo, on the southern island of Kyushu, the Kanto Plain near Tokyo, and Hachinohe in northern Honshu. Fuel operations are also housed in these same locatins as well. In addition, FISC also operates the Cargo Terminal at Yokota Air Base. Yokosuka Navy Base is located in the middle of the Miura Peninsula in the southeast portion of Kanagawa Prefecture, and faces Tokyo Bay on the east. The city is located 65 km south of Tokyo and 30 km from Yokohama. Yokosuka is the largest, and one of the most strategically important overseas US Naval Installation. The base is composed of more than 27,000 military and civilian personnel. Yokosuka is ideally located to give assigned personnel the opportunity to study Japan's past or catch a glimpse of her future. Visitors can travel to the nearby port city of Shimoda for the Black Ship Festival to commemorate Commodore Matthew C. Perry's landing in 1853; or, board a train for the 55-mile trip to Tokyo to see the whirls, blinks, whiz bangs and blips of the latest and greatest gizmos to hit the Akihabara Electronics district. At the Yokosuka-Chuo train station, which is just a short walk from the main gate, you can purchase a ticket north to Tokyo or south to the beaches at the tip of the Miura peninsula. There are a wide variety of recreational options at your fingertips. At the 300,000 square foot Fleet Recreation Center, located within footsteps of the waterfront, you will have access to a huge gym, several racquetball courts, a state-of-the-art weight room, outdoor gear and even an internet caf&#eacute. One of the issues driving the talks are housing shortages and inadequacies for U.S. personnel assigned in and near Yokosuka. At Yokosuka Naval Base, for example, families seeking on-base housing are placed on waiting lists that stretch for as long as 3 years. Yokosuka is one of the bases in which more housing is being built within the existing base perimeter. Officials say two housing towers scheduled for completion in December should raise the percentage of families living on base from 74 percent to 79 percent, edging closer to a goal of 90 percent. 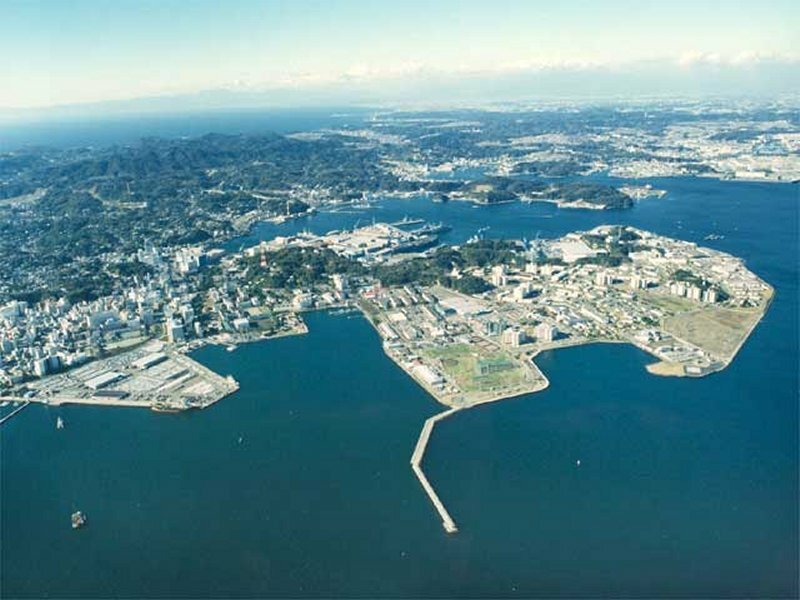 Yokosuka is an accompanied tour area with concurrent travel of dependents authorized. On- base housing is authorized for accompanied personnel of grades GS-12 and above. The current waiting period is from 27 to 40 months for 3-bedroom housing and 10 to 15 months for 4-bedroom housing. 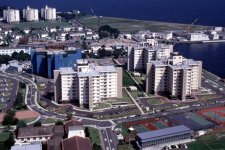 There is a five-year occupancy limit for civilians due to the critical shortage of Navy Family housing in the Yokosuka/Yokohama area. Waiting lists for housing in other areas of Japan vary. Residence in the BOQ is authorized for unaccompanied personnel of grades GS-7 and above. Quarters will be furnished free of charge with the exception of a one- time fee of $50 for housekeeping when you vacate the premises. If Bachelor Quarters are not available, the employee may be authorized a living quarters allowance. 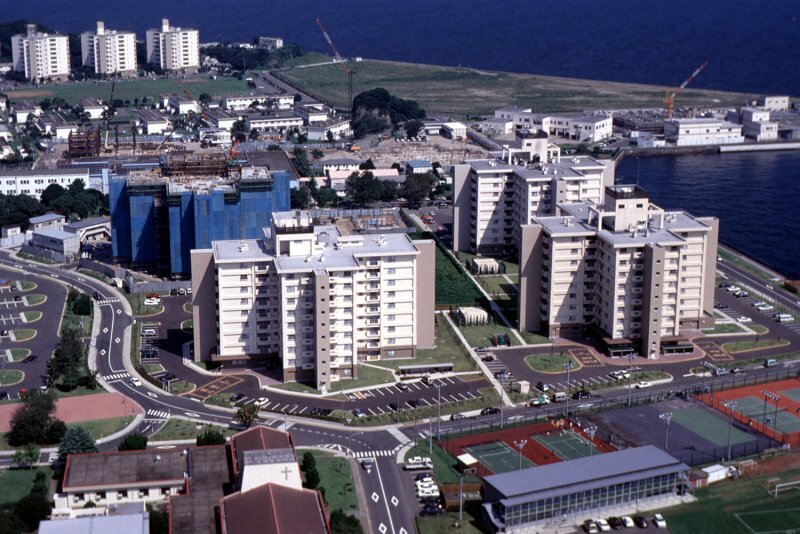 Navy Family Housing at the Yokosuka, Ikego, and Negishi areas total about 2,469 homes and apartments during 1977, They all differ widely in age, construction, and layout. In Yokosuka there are several variants of three and four bedroom concrete town houses usually in groups of four or six. Sizes and floor plans vary. Older units are provided with central steam heat and government furnished window air conditioners for each bedroom plus one for the living room. The newest town houses have central heat and air and vinyl tile floors. All have small fenced yards and limited storage. Many have patio covers for backyard enjoyment. Two domesticated pets (e.g., cats and dogs) are permitted. Presently, there are 10, nine-story towers with 48, two-bedroom apartments for junior enlisted. The four newly constructed nine-story towers consist of 68, three-bedroom apartments, and house all ranks and grades: Sakura Heights houses officers and civilians, Himawari Heights houses only senior enlisted, and Asagao and Ajisai and Fuji towers house a combination of senior and junior enlisted. All tower apartments are centrally heated/air conditioned houses only senior enlisted, and Asagao and Ajisai towers house a combination of senior and junior enlisted. All tower apartments are centrally heated/air conditioned and are equipped with attractive mini-blinds or pull-down shades in each room . All tower apartments have tile flooring. Each tower has a playground area equipped with modern playground equipment. All towers are pet restricted. No dogs of any size are allowed Up to two oneuted or spayed cats are allowed. The port of Yokosuka is located on the southeast coast of Honshu, the largest of the four main Japanese islands. The U. S. Navy port is situated adjacent to the central part of the Miura Peninsula on the southwest side of landlocked Tokyo Bay. A separate, commercial port of Yokosuka is located southeast of the U. S. Navy port. Yokosuka is one of three major ports in the area; the ports of Yokohama and Tokyo are also located on Tokyo Bay. The harbor of Yokohama, a large commercial port, is about 10 nmi north of Yokosuka Bay, and Tokyo Harbor is about 20 nmi north-northeast of Yokosuka. Tokyo Bay is relatively large, being about 35 nmi long from north to south and, except for its 4.75 nmi wide southern entrance, is surrounded by land. Over 200 ships transit Uraga Suido, the entrance to Tokyo Bay, daily. Yokosuka Harbor is entered through Yokosuka Bay in the southwestern part of Tokyo Bay. The harbor is bounded on the east by part of the Miura Peninsula, which is the site of U. S. Fleet Activities (FLEACTS) Yokosuka, and on the west by the island of Azuma Hanto. Azuma Hanto separates Yokosuka Harbor from Nagura Harbor which is a commercial port and is also used by the Japanese Maritime Self Defense Force (JMSDF). Nagura Harbor is entered from the southwestern part of Yokosuka Bay. A small, narrow channel separates Azuma Hanto at its southwestern end from the mainland. The entrance to the harbor is about 440 yd (400 m) wide between the 5-fathom (10 m) curves. Depths in the harbor range from 12 fathoms (22 m) in the harbor entrance to less than 4 fathoms (7 m) at the south end. The harbor can accommodate about 12 to 15 ships of various types at any one time. An average of about 35 to 40 ships enter or leave the port each month. 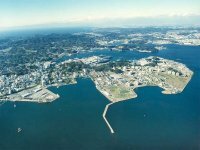 The Port of Yokosuka is located at the entrance to Tokyo Bay and continues to draw attention as the marine gateway to the Tokyo Metropolitan Area. Yokosuka is a very densely populated city on the Kanto Plain. The city became a municipal on February 15, 1907, the second city so designated in Kanagawa Prefecture following Yokohama City. The population then totaled 62,876. As of October 1, 1996, the population of Yokosuka City is estimated to be 431,334. The climate is similar to the Washington D.C. and Norfolk, VA areas; however, the spring and fall rainy seasons may be compared to the wet climate of Seattle, Washington. The seasons are well defined and are divided into six distinctive periods, unlike the four seasons we are familiar with in the United States. Yokosuka is an ever changing and very improving Navy Community located near the cosmopolitan centers of Tokyo and Yokohama, ideally situated to encourage both local and international touring. Yokosuka was also the 1998 winner of the Chief of Naval Operations' Installation Excellence Award given annually to the best base in the Navy.